Rail tank car blending has never been easier if you are using Pulsair. Pulsair mixing tanks systems have developed the best mixing tank technology for rail cars. Those advanced blending solutions have no moving parts inside the rail tank car. In addition the operator can pulse in compressed air or inert gases to quickly blend liquids in rail tank cars. 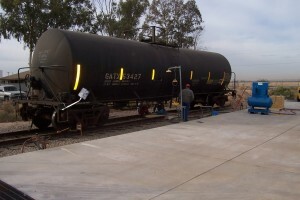 Rail car can quickly be converted to blending tanks using Pulsair. Due to the operator can attached the Pulsair rail car adapter to the bottom of the car. Thus there is no equipment inserted through the top hatch to mix the liquids. Heavy viscosity liquids and high solid content liquids have been already tested with the Pulsair mixing process for rail tank car. With over 20-years of experience in mixing and blending liquids in tank, Pulsair offers the faster tank mixing process with zero in-tank maintenance. More energy efficient than heavy and dangerous top-entry mechanical mixing alternatives.